"Gabby Giffords' gun-control group gets new law enforcement allies," USA Today reports. * "[She] and her husband, retired astronaut Mark Kelly, have some new allies in their fight to end gun violence. And all of them are armed." The purpose of this feature has never been to bash cops. The only reason I do this is to amass a credible body of evidence to present when those who would deny our right to keep and bear arms use the argument that only government enforcers are professional and trained enough to do so safely and responsibly. And it's also used to illustrate when those of official status, rank or privilege, both in law enforcement and in some other government position, get special breaks not available to we commoners, particularly (but not exclusively) when they're involved in gun-related incidents. But back to Mark and Gabby and their Americans for Responsible Solutions group. They've already recruited some high-level military oath-breakers, and politically ambitious/career über alles LEOS have also always been a perfect fit for the gun-grabbers. Their "advisory committee" is made up of 20 LEOs who have no problem infringing on the right of the people to keep and bear arms in spite of their oaths. 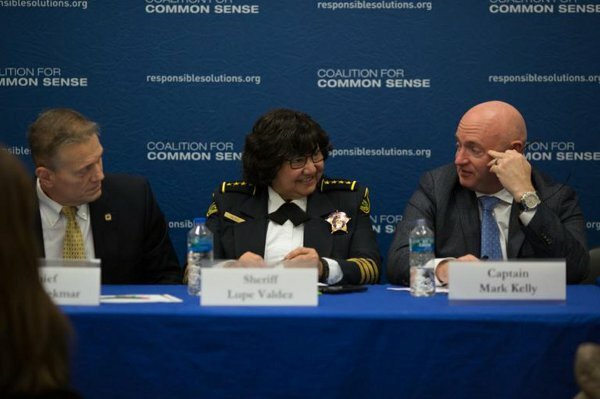 Naturally, they present their infringements under the banner of "Law Enforcement Coalition for Common Sense." And predictably, they'll be relying on emotion-ginning propaganda optics, such as laying a wreath at the National Law Enforcement Officers Memorial. [The] coalition ... will help them oppose gun legislation pending in Congress, including a bill that would lift restrictions on firearm silencers and another that would require states to accept concealed carry permits from other states, even from states with weaker requirements.